I understand the basics of what a Support Vector Machines' aim is in terms of classifying an input set into several different classes, but what I don't understand is some of the nitty-gritty details. For starters, I'm a bit confused by the use of Slack Variables. What is their purpose? Now, there are some problems left. First of all, what to with those nasty outliers laying shamelessly in a center of cloud of points of a different class? To this end we allow the optimizer to leave certain samples mislabelled, yet punish each of such examples. To avoid multiobjective opimization, penalties for mislabelled cases are merged with margin size with an use of additional parameter C which controls the balance among those aims. Yet again, with some math and we can see that this whole transformation procedure can be elegantly hidden by modifying objective function by replacing dot product of objects with so-called kernel function. Finally, this all works for 2 classes, and you have 3; what to do with it? Here we create 3 2-class classifiers (sitting -- no sitting, standing -- no standing, walking -- no walking) and in classification combine those with voting. Ok, so problems seems solved, but we have to select kernel (here we consult with our intuition and pick RBF) and fit at least few parameters (C+kernel). And we must have overfit-safe objective function for it, for instance error approximation from cross-validation. So we leave computer working on that, go for a coffee, come back and see that there are some optimal parameters. Great! Now we just start nested cross-validation to have error approximation and voila. This brief workflow is of course too simplified to be fully correct, but shows reasons why I think you should first try with random forest, which is almost parameter-independent, natively multiclass, provides unbiased error estimate and perform almost as good as well fitted SVMs. 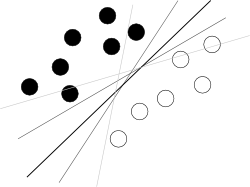 How does Support vector machine predict the classes for the test points? What is the difference between SVM and LDA? 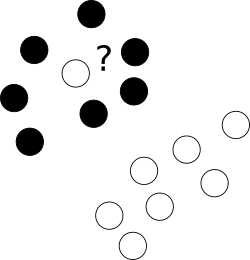 Is support vector clustering a method for implementing k-means, or is it a different clustering algorithm? Why are svm training labels +/- 1? The difference between logistic regression and support vector machines?